This example shows how to add custom information to a voxel and pass them the vertices. // starts logging to console and file. blub::log::system uses boost::log. // class Handler initialises Ogre3d and OIS and handles their callbacks. scopedPointer<t_voxelAccessor> voxelAccessor; // is an optimised buffer for the surface calculation. Takes the voxel needed for the surface calculation from the voxelContainer and caches them. scopedPointer<t_voxelSurface> voxelSurface; // Takes the optimsed data from voxelAccessor and creates an iso-surface out of it. 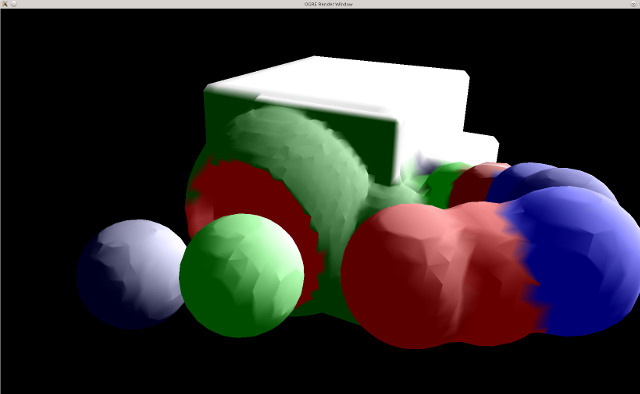 scopedPointer<t_voxelRenderer> voxelRenderer; // handles the rendering. Checks if a tile is too far away or too near. Handles when to render a crack-closing subentity. // does all the terrain work on 4 threads. t_voxelRenderer::t_syncRadiusList lodRadien(numLod); // defines how far a tile on a lod has to be away to get rendered. // start rendering and begin terrain worker. terrainDispatcher.start(); // NOW it starts creating the voxel.